Following news that WEC is not confirmed for 2017 at COTA, Pirelli World Challenge confirms move from March to Labor Day Weekend for 2017 Austin stop. ...and it also looks like Ratel is taking the Intercontinental GT Challenge Event (originally scheduled here at COTA in March 2016) to Laguna Seca in 2017. Bummer. OBTW, those PWC boys might be in for a surprise on Labor Day weekend. It's a helluva lot hotter here that weekend than it is at the beginning of March (when it can actually be pretty chilly). It's typically at or near 100 degrees, and the hottest day I've ever experienced in Austin, 112 degrees, was in Labor Day a few years ago. COTA's not a place any sane person wants to spend long stretches at in that kind of heat. The hottest race I can remember out there was V8SC, when it was in the low 90s...and it was absolutely brutal. My 11 year-old is going to go through the roof when I tell him about Bruno Mars. He is not much into motorsport, I don't push it on him (my 7 year-old is another story), but I think as soon as I mention this he's going to beg to go. Grinding them bumps, again. Interesting that it's not in the F1 braking zone, despite claims that the bumps are just caused by F1 cars. Just like much of the grinding last year along the back straight was off-line. Wonder how the MotoGP boys are going to react. Very interesting, Tim. I think it is the most bumpy in the braking zone for T15, hopefully they can do some smoothing there, looking at Pedrosa last year, his bike and he were all over the place because of the bumps. I really wish the'yd reduce the asphalt runoff on our track. it is so unnecessary in EVERY corner. Never happen, of course, but here's to wishing. It's not great there, & those particular bumps can make you understeer or just bounce outside the apex there pretty easily. But it's really pretty bumpy almost everywhere now. The long straights seem the worst to me, esp the back straight, and the esses & T18 are getting worse imho. Coming down from T1 through T2 is no picnic now either. The back end steps out repeatedly on the bumps under hard acceleration down & around T2. MotoGP: Track drama ahead in Austin? This weekend’s American Grand Prix could throw a spanner into the works for race organisers as they remain on knife edge to see what sort of situation greets them at the Circuit of the Americas in Texas. It’s an issue that faces road construction in the area as well, with new routes often prepared and then left to stabilise for up to a year before being completed. To remedy those bumps, circuit staff have attempted to utilise heavy road construction planning equipment in recent weeks to uniformly sand down the track and remove them. However, that’s believed to have exposed the ultra-abrasive under-surface of the asphalt in places, leaving the track potentially highly abrasive on tyres. Still to be properly assessed by the riders, MotoGP’s safety representatives and sole tyre supplier Michelin, there’s a possibility of extreme solutions like mandatory pit stops being introduced to this weekend’s event if the track is found to be not up to scratch. Any action is unlikely to come until after the opening day of action and the subsequent Friday night safety commission meeting, however. Huh. Who could possibly have seen this coming? ​MotoGP riders say that the efforts to reduce the bumps at Austin’s Circuit of the Americas have failed to address the issue, while simultaneously creating a huge amount of dust on the track’s surface. Honda’s reigning champion Marc Marquez echoed his 2017 title rival’s thoughts. “Of course we expected less bumps, but it's very similar like last year,” said Marquez, who topped the opening session of the weekend by four tenths from Valentino Rossi. Danilo Petrucci had some strong words for the condition of the Circuit of the Americas after day one of the Austin MotoGP. Prior to the event, industrial grinding machines were used to try and reduce the notorious bumps - but Petrucci was one of several riders who said they are worse than ever. "Here we struggle a lot on the bumps. They say they shave the bumps, but maybe they shave in another circuit because the bumps are much more than last year," he said. "I think it's not safe to race on a track like this. I mean we are in a world championship and I never found a track like this even in the national championship. "For sure the world championship is the hardest one of the world - and we have to race in every condition and every track. "But crashing because of bumps I think is a thing that maybe Hailwood and Agostini had in their careers! And today, a lot of crashes for the bumps." COTA Chairman Bobby Epstein tweaked the critics. I’m not sure I’d Epstein’s response was in jest, but if it wasn’t, what an idiotic statement. COTA is in the last year of its contract And this does nothing to engender confidence in rectifying the track issues, which are substantial. The bumps are very obvious (I’m at the circuit all three days) on video replays, and the dust on the back straight from the smoothing is bad. Ugh. 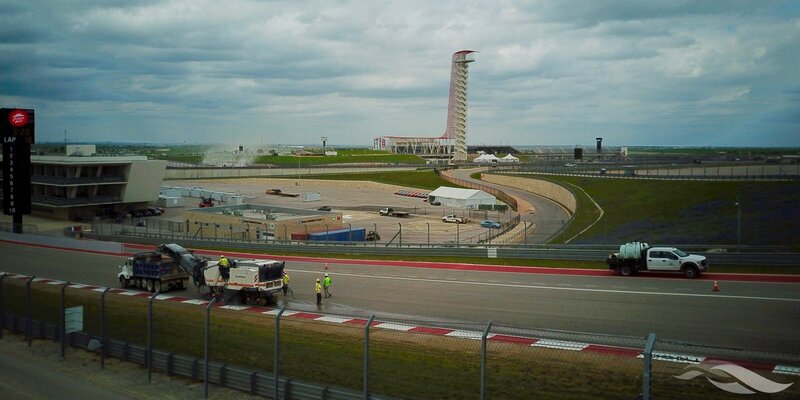 I sure hope COTA will be renewed. If not, I’m going to Mugello in ‘19 or ‘20. Crutchlow: "I think they’ve made a terrible job," he said. "They tried to make it better but they made it worse. I know last year was bad, and now it’s even worse. "I don’t understand how we can come to a GP and it’s worse than last year," he fumed. "I love this circuit, but it’s bad. It’s honestly bad that we now come to GPs and the circuit be in this shape." "They haven’t really done anything. "It’s so dirty, and so bumpy you can’t imagine. I love this circuit, but it’s bad. It’s honestly bad that we now come to GPs and the circuit be in this shape. "And it’s so dirty you can’t imagine. You can’t see down the back straight if you’re behind someone." Rossi: "It’s a disaster," said Valentino Rossi. "For me it’s the worst situation during all the season. You have three or four bumps that are very big." "Back straight, after the hole, you go up, you go over the crest, [in] fifth and sixth [gears] the bike moves a lot because of big bumps. There are a lot of bumps in the braking [zone] also," Rossi added. "Maybe the biggest one is Turn 18, before the last two lefts, the bodywork touches the ground, so it’s like motocross. Personally, I like very much this track, but the bumps start to be a problem." "Last year we asked to do some improvements. They did something, but unfortunately it didn’t work." "It was like being at the ranch!" Rossi complained. "You don't see anything in front, and it's very strange ... Maybe coming from the asphalt, but I don't know." Miller: “We’ve broken a windscreen already with the rocks and the dust," he said. "It’s so bad down that back straight, it’s ridiculous. "It was like big old rocks hitting me at 300km/h," he added. "They felt like bullets. I wasn’t too keen on that." “From my past experience, and my theory, dirt and water on top of a normal track normally don’t combine too well"
FYI, Dunno if this article is right, and I hadn't heard this until now, but it seems COTA has no MotoGP contract as of yet for 2019 and beyond. Epstein said ticket sales were up “double digits” this year. However, MotoGP’s contract with COTA also is up after this year, the sixth time Austin has been host to the series. Dorna, the Barcelona-based rights holder for MotoGP, keeps its cards close to the vest and will weigh riders’ criticism of the bumpy track, which surfaced again Friday even after repeated efforts in recent months to smooth out rough spots. They've done bump grinding operations more than once, including in the weeks before the MotoGP event, but the track's never been resurfaced. At least it looked all right at the end of the third day, but I still cannot believe Epstein's stance. Before Sunday, it looked like the track was wet due to the dust, and it wasn't...like the photo that Shoot999 posted. I was working one of the corners during the motogp race and was doing track walks between sessions. There was a 3x5" hole coming on to the main straight that kept opening up throughout the weekend. It was getting chipped away at, and I'm sure there were other parts of the track doing the same. So those "rocks and pebbles" they kept getting hit with, could have been parts of the track getting ripped up and thrown around. Not only that, cracks were developing on the racing line. Its bad. Also, Brittney Spears has been announced as the Sunday act after the GP.